The LG Chocolate BL40 has a HD LCD screen that is four inches with a resolution of 800 X 345.The 5 mega pixel high end camera with a Schinder-Kreuznach lens and inbuilt flash and auto focus is testimony to LGs emphasis on ensuring quality of image within its camera equipment. It is 3G HSDPA and Wi-Fi enabled and also with an FM Radio. The basic advantage this phone provides is users need not whorl horizontally while browsing the net since you can see the contents of the entire web page. The Mobile Internet experience can be much faster with 7.2 HSDPA. It boasts of upgraded UI with 3D graphics. The LG Chocolate features 4.0-inch wide screen HD LCD with an 800 by 345 pixel resolution which is brilliant viewing quality. The Mobile sports a superior quality 5 mega pixel camera with Schinder-Kreuznach lens and flash. LG BL40 presents 21:9 aspect ratio for a panoramic, cinema-like quality and optimal mobile computing experience. LG Chocolate BL40 mobile phone users will experience a breathtakingly convenient and efficient mobile environment with the enlarged mobile handset screen. Browsing the Internet on 2G and 3G is made unbelievably easy because with 800 pixels there is no need to whorl horizontally to read entire web pages. The 4.0-inch display also features a Dual Screen UI that can efficiently display two different types of content simultaneously. The wide HD LCD Real VGA screen presents a vibrant range of natural colors, letting photos to appear sharper, videos more true-to-life, games naturally vivid and documents more readable. Some other specifications of the LG BL40 mobile phone include Wi-Fi connectivity and FM transmitter. Ostensibly, the LG handset supports 7.2 HSDPA offering faster email and internet functionalities. 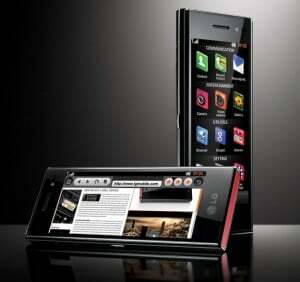 LG Chocolate BL40 will retail in India at Rs.30,000. Nice piece of black chocolate bar!